FORMULA 1: Formula One champions Sebastian Vettel and Michael Schumacher have come out in support of Bahrain’s return to the grand prix calendar this year, despite ongoing clashes in the Gulf kingdom. Both two-time defending champion Vettel and Schumacher, who has seven world titles, said they would be happy to race next month in the desert state if the sport’s governing body declares it is safe to attend. “If they decide it’s safe we shouldn’t worry. I’m happy to go (to) Bahrain,” Vettel told journalists. But there is no such indifference in Bahrain itself, where activists say the Grand Prix would legitimise the current regime. On Sunday (April 1), Bahraini police fired tear gas and arrested demonstrators in two Shiite villages as protests were mounted against the F1 race going ahead. Dozens of young protesters gathered in the village of Abu Saiba, west of Manama, and Tubli, south of the capital. The Bahrain round of the world championship is slated for April 20-22 at the Sakhir circuit, southwest of Manama. 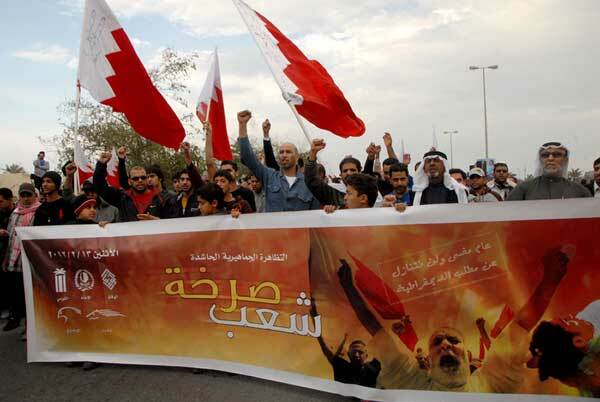 The race was cancelled last year due to the unrest that gripped the Shiite-majority state after a mid-March brutal crackdown on protests demanding democratic reforms that would challenge the power of the Sunni Al-Khalifa ruling dynasty. read by a youth dressed in a white death shroud and a black hood, according to a video posted online. “Stop, my blood is flowing” and “race over blood,” were two slogans posted by activists on Twitter, where hashtags like BloodyF1 and NoF1 generate scores of tweets.But Formula One supremo Bernie Ecclestone has insisted that the outbreak of fresh violence will not affect this year’s grand prix. And Schumacher, when questioned separately about Bahrain, also said he was satisfied there was minimal risk despite enduring tensions following last year’s deadly crackdown on political unrest. “I’m honestly pretty relaxed to go there. From our perspective... we’re going to be very well looked after, because they might foresee whatever and will be prepared,” Schumacher said. “I’ve quite a few good friends over there and I’m pretty sure that for them it’s a very important event and they just want to make everybody happy. think about and we don’t.